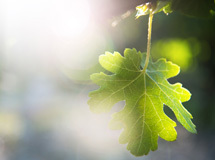 Innovative use of products to replace traditional oak and other costly imported wood derivatives led to recent launch of no-sulphur-added red wine. 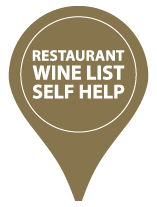 Hangoverless: Audacia’s Code-Breaker no-sulphur-added red wine is said to allow people who are sensitive to sulphur or sulphites often used in wine making to enjoy a glass without the normal side effects. It will be available in the near future at selected stores of a national retailer and at the Audacia Root44 market near Stellenbosch. Picture: SUPPLIED. The names Rooibos and Honeybush are as proudly South African as braaivleis, boerewors and the Springboks — and the plants are now being used to produce a healthier wine. Rooibos and Honeybush, long-time luvvies of the local tea-drinking scene, have been elevated to a different class altogether by news that they have achieved fame in the global world of Intellectual Property (IP) as well as a new super power. It is well-known that the tasty and healthy teas have a dedicated following in South Africa and beyond. And it is easy enough to believe that the patents granted to these two national treasures have caught the attention of the international IP community. The extensive trademarks and patents protecting two of South Africa’s unique botanical treasures, namely Rooibos and Honeybush, has caught the attention of the international community where the Minister of Home Affairs, the Honourable, Malusi Gigabahas been invited to deliver a keynote address at this year’s 56thGeneral Assembly of the World Intellectual Property Organisation (WIPO). Watch our award-winning winemaker, Michael van Niekerk, chat (in Afrikaans) about Audacia's revolutionary lower kilojoules red wine blend made with honeybush wood. 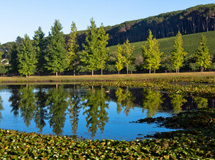 Audacia joins fellow Stellenbosch producers in creating an innovation that goes back to making things as nature intended and with a local slant. Read Marion Whitehead's informative article by simply clicking on the link below. We launched our new Honeybush-wooded low alcohol and low-kilojoule wine with Alan Winde, Minister of Economic Opportunities, Western Cape Government on 23 February 2016. Read more in the front page article of The Newspaper below. Read an in-depth report on our revolutionary new Honeybush-wooded low kilojoule wine which appeared in the March 2016 edition of The Newspaper below. Watch the launch video of our revolutionary low alcohol and low kilojoule red wine made with indigenous South African Honeybush (toasted wood chips) below! The first wine in the world to bear detailed nutritional labeling! Our landmark low alcohol/low kilojoule Audacia Natural Red is wooded with indigenous South African Honeybush (toasted wood chips). The Honeybush flavonoid, Hesperitin is the magic ingredient which helps to enhance flavour and maintain structure while keeping residual sugar content very low." ENCA's Tanya Nefdt reports that health-conscious people and kilojoule counters the world over may have found something unique to pair with their diet: Audacia's latest innovation: a low kilojoule and low alcohol wine made using indigenous Honeybush wood chips. February 2016. Read this great piece on our Rooibos Wooded Wine innovation written by Longevity magazine's Khyerne Danu, who writes: "Thanks to founder Trevor Strydom, we can now drink indigenous, sustainable wine that is free of added sulphur and preservatives, as well as being low-alcohol and low carb." 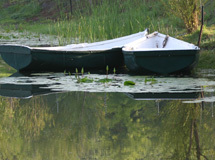 Ingrid Graham gives you three reasons to 'go bos' this month and naturally, we're included! Good Taste Magazine's Kim Maxwell, writes: Audacia's green offering sets them apart with a locally lekker hook that could have potential health benefits. In case you missed it, catch us on Travelstart blogger, Rebecca Houston's list at no.12! 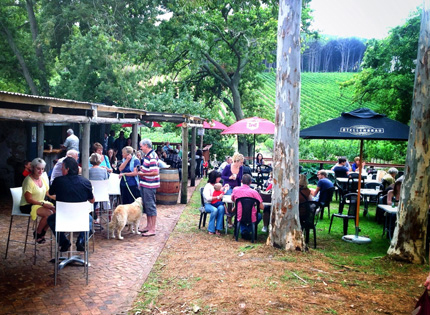 "Drink a World First Rooibos Wood Matured Red Wine at Audacia Winery, Stellenbosch." Our landmark innovation of using indigenous woods rich in antioxidants to preserve wine continues to make international headlines. Watch an insert which recently featured on the renowned news network here. A great video made by the team from Skybound Productions showing our 2015 harvest in action and emphasizing that while we make big new worldwide, we're still a small, traditional boutique operation. Dynamite, as they say, comes in small packages! Famed Indigenous Plants used to make Wine. CCTV's Travers Andrews reports on the breakthrough innovation of rooibos wooding of wine, beer and cider on Africa Live. First aired 14 March 2015. Western Cape Minister of Economic Opportunities Endorses Innovation. 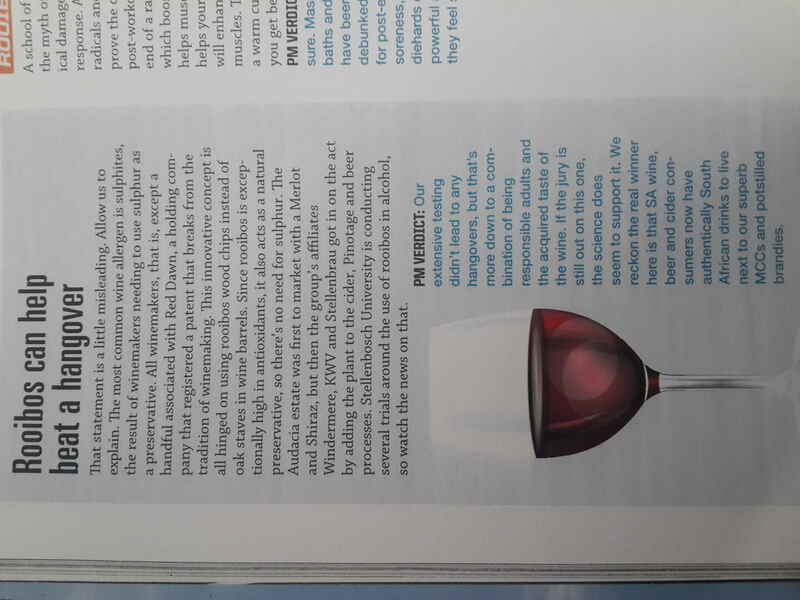 Audacia's Rooibos Wooded Wines is making news in all circles, including Popular Mechanics Magazine. Read their article on our innovation by clicking on the link below. German speakers will enjoy this clip on our Rooibos Wooded Wines put together by Armin Goebel and his team on our latest innovation. Audacia's Rooibos Wooded Wines feature on the site, "Drinking in America" in March 2015. We're global news, from the US to the Ukraine! While we prefer not to use 'healthy' and 'wine' in the same sentence for obvious reasons, there's no denying that a sulphur-free alternative might be considered a 'healthier' option by some. America's Shape Magazine investigates the Audacia Rooibos Wooded Wines in an article published March 12th, 2015. Read an article which appeared on the Unites States' Fox News Channel website on March 9th, 2015, regarding Audacia's Rooibos Wooded Wine innovation. Read Norman McFarlane's excellent piece which graced the cover of The Bolander community newspaper on Wednesday, March 4th 2015, on Trevor Strydom's innovation of using endemic rooibos and honeybush in the winemaking process. A highly informative read. Watch a video made by Jessica Ricketts of Skybound Productions which summarises highlights from the event. 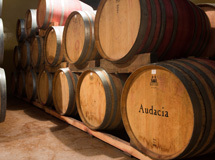 On 26 February 2015, Business Day reported on Audacia Wines replacing traditional imported oak wood derivatives with indigenous rooibos wood to produce a wine with no added sulphites or other preservatives. Watch a video put together by news agency, Reuters, on Audacia director, Trevor Strydom's, innovation of using indigenous rooibos and honeybush woods in wine as a means of preserving and flavouring it, without the need for sulphur and other preservatives. In February 2015, our rooibos and honeybush innovation featured in Sawubona, the SAA in-flight magazine. Read this great article contextualising alcohol made with fynbos plant materials in terms of the rooibos and honeybush industries as a whole. Read a fascinating interview conducted with Audacia's Trevor Strydom about his visionary outlook and general chuztpah which lead to the revolutionary innovation of using rooibos and honeybush plant materials to preserve and flavour wine. The piece appeared in the January 2015 issue of MAN magazine. Click here to download full news snippet. Click here to view the full news snippet. Listen to an interview on Cape Talk 567 about the breakthrough innovation of using rooibos and honeybush wood in the making of wine and other alcoholic beverages. Read Wineland magazine's fascinating article about how viticultural innovations at Audacia have led to the making of award winning wines! Overlay a map of the Olifants River wine region with that of the world’s only natural plantations of rooibos and the similarity is uncanny. The question arises: might there be other links between these vines and this unique plant renowned for its curative properties? Audacia winemaker Michael van Niekerk has been awarded with two gold medals, as well as a silver medal and a bronze award by the judging panel of this year’s SA Young Wine Show. 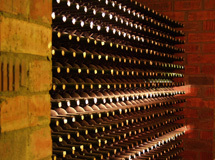 Presented annually by the South African National Wine Show Association (SANWSA) – the SA Young Wine show gives winemakers the opportunity to showcase the best wines of their current vintage. Michael van Niekerk of Stellenbosch farm Audacia is doing what no other winemaker has done before – making wine using rooibos wood. 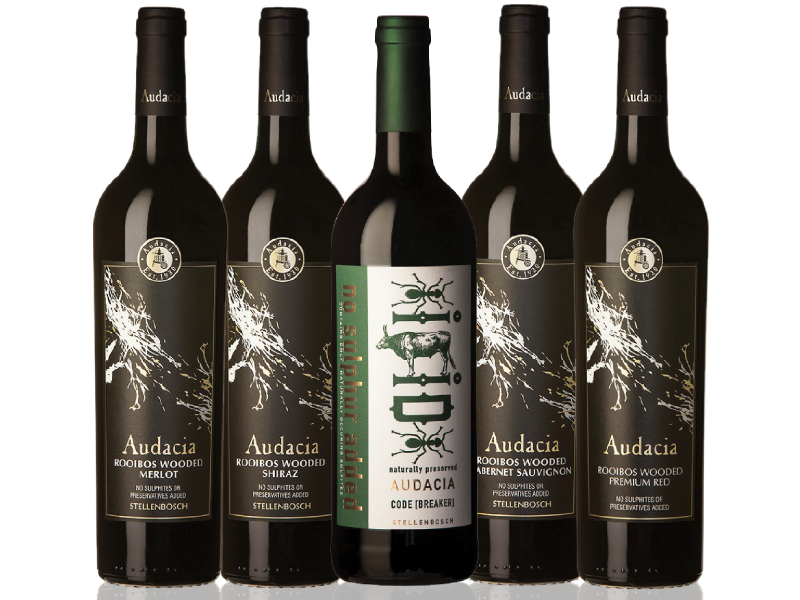 Audacia Wines from Stellenbosch have launched a unique “No Sulphites or Preservatives Added” Merlot. The use of Rooibos and Honeybush wood in the wine-making process creates a light, graceful red wine alternative, free of traditional amounts of allergy-inducing preservatives. 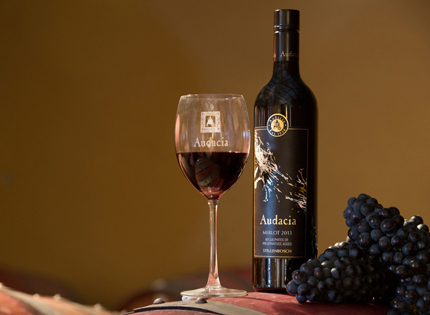 Audacia Wines of Stellenbosch, South Africa’s viniferous capital, is set to launch a world first – a unique ‘No Sulphites or Preservatives Added’ red wine created using indigenous Aspalathus linearis (Rooibos) and Cyclopia genistoides (Honeybush) wood. The wine, a merlot from the farm’s 2013 harvest, is the first of an exciting range to be made according to this method – the technology of which is exclusive to Audacia, which also owns the patent.